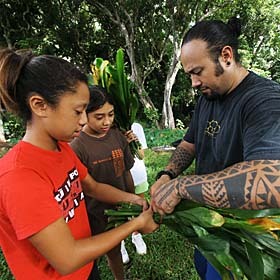 Fifth- and sixth-graders at Anuenue School, a Hawaiian-language immersion school, collected ti leaves yesterday near the loi (taro patch) next to the school, for their upcoming La Kupuna (Grandparents' Day) on Sept. 14. Comprehensive. Entertaining. Resourceful. Your guide to UH football. The state Health Department has issued a report to encourage better health.